Maybe someone could help me with this problem. I know there are a lot if comments about this subject in the forum but i havent found anything which describes my behaviour of my cayenne S.
I have random problems with PSM failure. From time to time its showing up on my display. Sometimes during driving, sometimes when i start the car after parking. I try to give some samples when and what happens. Driving to office in the morning. After 10 minutes of driving i had to stop because of traffic jam. PSM warning light coming up but still possible to drive. Starting the car in the morning. PSM light coming up. Engine starts very very hard. Shaking and stottering. Very bulky start. Not possible to drive. Driving home at evening from office. Same story. Bulky start. Not possible to drive. Driving in the city. Stop on a red light. PSM light coming up but possible to continue driving. Between all this time the car runs without problems. Even a trip to italy. 10 days with 2000 km in total. Not even one time a problem with PSM. What i did to solve the problem at the moment it appears: i switch on ignigation for one minute without starting the car. It helped. I reset the DME by using the method with key inside, pushing the gas pedal 5 seconds. Etc. I guess everybody knew this. Porsche mechanics are frustrated. Me too. Maybe here someone has a idea what is going on there?! Since the occurrence of your problems seems restricted to starting or low speed running I would suspect a low voltage issue: bad earth/ battery/ alternator. Thank you, your advice really makes sence but battery under the seat is almost new. voltage on my gauge is showing arround 14 volt. Piwis showing usual numbers too. What you mean with bad ground? Should i get the battery tested? Is there a way to find out if alternator is in bad condition? Today in the morning the same. Starting and driving to shopping mall. No problem. I have a usual suspension with Eibach lowering springs. I will go for a new battery and check the speed sensors on all wheels today. But as i remember, a bad sensor must throw out a code. Isnt it? mcbit500 was right i guess. i changed the battery . no problems so far and there is a feeling - maybe placebo effect - the car is driving different. thank you all for try to help me. by the way........... first time i pay attention to all the wires and connections under the seat. there are 2 yellow clips. just one is connected , the other one is closed with a tape. anyone a clue for what these connections are? 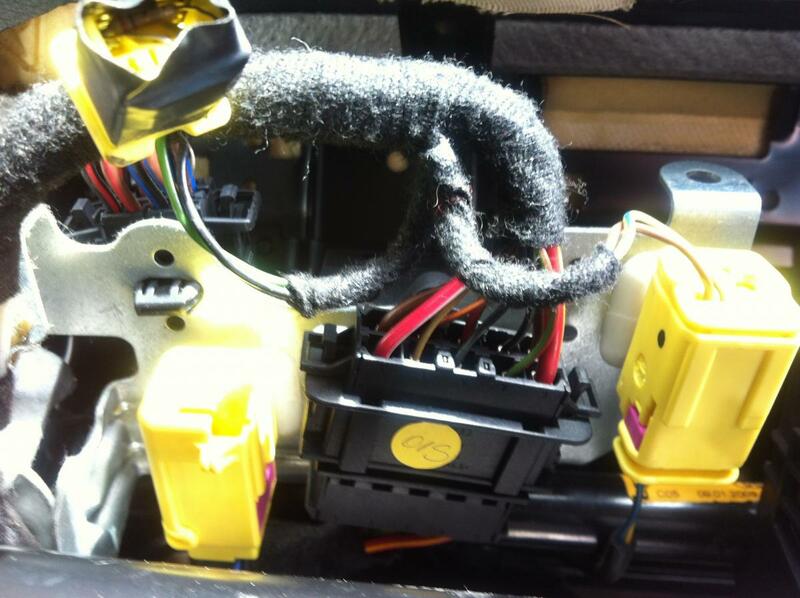 Yellow connectors are mainly used on airbag systems, check with a PIWIS whether the system is still intact and working, seems to be a abnormal situation if you ask me. I'm always serious, never mess with yellow connectors and their wirings. Follow the wiring and look where they arrive, that would be a good start, or use a diagram, this is even better. Jesus. What to expect from a porsche service guy if he didnt notice this. They changed battery 2 times and they never had a look at this wires. Scares me. Do you know from where to get a diagramm to check these wires? The new battery; everything looks fine. The battery is a really weak part in this car. This is the second one within 16 month. to "recharge" the battery. Long winter in germany. Always city driving with lights on, heating system and and and. Reason. It happens with me now second time. Spent 150 dollar and the headache is gone. Thank you everybody for helping me. Glad to hear that your problem is solved. Batteries are funny things, I just bought a 2009 CTT which had a dead battery when I went to look at it; I had it PPI'd and the shop confirmed that the battery was shot. The car did not have service book with it so I obtained the FSH from the local Porsche dealer (at which point i discovered that this car had actually been owned by them since new) and found that the CTT had a new battery about 18 months earlier. Since putting the latest new battery in I have issues at all with the car. However, I have a 05 CTT which is still running well on the original battery 8 years later. As a side note, receiving the FSH of a dealer owned vehicle was a real eye opener as all the prices, parts and labour, on the service sheets are COST not retail. One example being Mobil 1 at 60c/ltr as opposed to the $1.25/ltr that they charge the public. I need your help again please. The PSM Problems following me like a shadow. Again and again. Something must be wrong here. Always when PSM failure is on the display i take it to service. Sometimes its still possible to drive, sometimes the truck isnt even starting. Just shaking arround. Porsche is checking the system by piwis to find out what is the reason. 1. time piwi show throttle body, the changed for new. 2. time piwi show lambda sensor, the changed for new. 3. time piwi show MAF sensors, the changed for new ones. Just 2 weeks ago. Between i changed already 3 times the battery. Now i have the same problem again. Today i had to drive somewhere. When i wanted to drive back and started the car...... same. Very bulky start. Not possible to drive. I waited some minutes and tried again. Car was running.I could make it home but on the way back again PSM warning light. Jesus what is this. If i take the car to porsche on monday piwi will show maybe some other stupid code which is again not the reason . I can not change part after part and problems still remain. Maybe someone has an idea what the heck is going on here. Is there any change in the symptoms if you turn the PSM off? If the failure accours already on the display PSM is not possible to shut down. Um... did the scan the transmission and PSM with PIWIS too?